In 1958, Hillcrest Jewish Center Day Camp came into being as a result of the vision and work of Hillcrest Jewish Center Youth Committee Chairman (and later Hillcrest JC President) Dr. David Abramson. Dr. Abramson entrusted Bert Rosenberg, who served as the Founding Director of Hillcrest Jewish Center Day Camp, with the implementation of this vision. From 1958 until 1987, Bert Rosenberg played an integral role in creating the Hillcrest Jewish Center Day Camp we have all come to know and love. 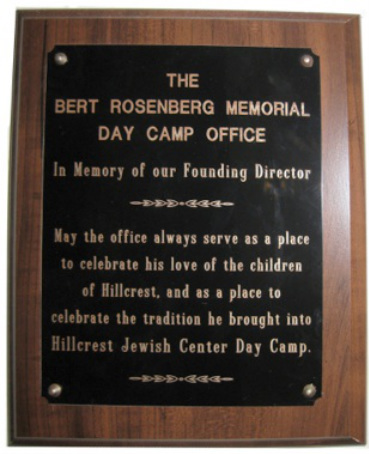 On July 16, 2010, the Hillcrest Jewish Center Day Camp Office was renamed “The Bert Rosenberg Memorial Day Camp Office” in recognition of the lasting contributions Bert made to HJCDC. Following the dedication of the office, campers and guests were treated to Bert Rosenberg’s favorite lunch: spaghetti and fishsticks. After the meal, the 10/11 Boys led Birkat Hamazon and concluded by lifting their table above their heads - a tradition from Bert’s time as director that had not been done at HJCDC in decades. In 2006, Bert Rosenberg shared some memories with Jeremy Bernstein, a former Assistant Director of HJCDC and son of one of Bert’s Assistant Directors, Sidney Bernstein. Bert’s memories are reprinted below.